The RG501A is a dual voltage full-featured regen drive with a field supply in a rugged enclosure. This high performance drive maintains motor speed with automatic motoring and braking torque, while allowing high-duty cycle reversing and braking. 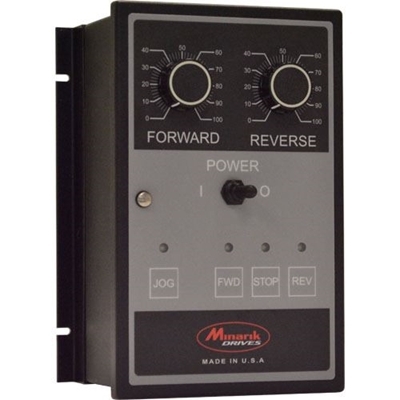 The RG501A has conveniently mounted operators, which include a power on/off switch and separate forward and reverse speed potentiometers so independent speeds for each direction are easily set. Controlling the motor is easy too, by pressing a button on the membrane panel for stop, run, reverse or jog (jog speed is adjustable). The user can also wire in remote pushbuttons in conjunction with the on-board buttons. Included and wired into the RG501A package is our limit switch logic board (200-0386A). This mini-PLC can operate in one of nine modes between limit switches including continuous cycling, single cycle, dwell and more--including adjustable stop and dwell times!